I joined this tour with my wife. I am in my early 50s while she is in her late 30s. We joined this tour to snorkel only and did not scuba dive. Pros: Punctual pick-up from our hotel. The staff were very friendly and tried their best to communicate with us in English/Chinese. Lunch (bento) was included and hot water/tea is available on board. The boat had toilets and even shower facility. Cons: The boat ride to the Keruma islands took an hour (much longer than I expected). Although the waves were not too strong, the hour long journey was enough to make many of us seasick by the time we arrive at the first snorkel/diving spot. By the end of the trip my wife & I weren't the only ones who threw-up, and we felt so nauseous we didn't eat the provided lunch. On the snorkeling experience. The waters around Okinawa is beautifully blue and super clear. I saw a total of 4 turtles in my 3 snorkels but to be honest, the marine life is not very plentiful. There are no big fishes (sharks, stingrays..) to be seen and even the small fishes are not many and not too colorful compared to the tropical dive/snorkel places we have been to (Maldives, Thailand, Malaysia). Come for the beautiful, clear blue waters, white sand and sea turtles in summer. The water is also slightly too cold in November. Dive deep into the wondrous Blue Cave of Okinawa and interact with the colorful marine wildlife that reside there. 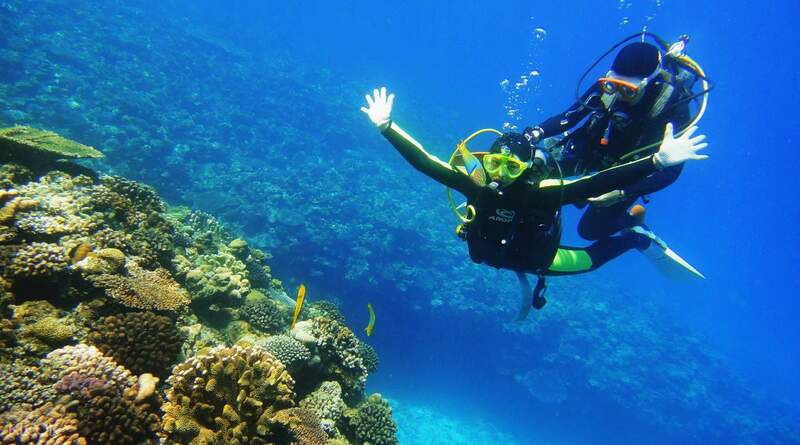 Whether you prefer to scuba or snorkel, you’re guaranteed to experience an incredibly atmospheric dive. Feel the rush of excitement as your eyes adjust to the cave's darkness and the dazzling blue light beneath you gets brighter and brighter! Come face to face with the variety of friendly wildlife from angel fish to eagle rays. Share in the excitement of this unique activity with all family members, as children older than five are welcome to get involved! If you’re apprehensive about walking the 100-step staircase to the blue cave with your equipment, or are with young children, we recommend choosing the boat option that takes you directly to the cave. Either way, you'll get convenient pick up right from your hotel and friendly staff to guide you by foot, or take you by boat to the Blue Cave. Make it a family affair at the bottom of the ocean! First time scuba diving! It was a very fun experience! Very nervous at first but our instructor gave us time to get use to breathing underwater before diving deeper. The only scary part was the slight pain caused by the pressure in the ears when going deeper. It was a challenge for me to equalise the pressure. First time scuba diving! It was a very fun experience! Very nervous at first but our instructor gave us time to get use to breathing underwater before diving deeper. The only scary part was the slight pain caused by the pressure in the ears when going deeper. It was a challenge for me to equalise the pressure. Best choice for whom travel without your own car as the coach will pick up from where you stay and provide all equipment you need for diving! Highly recommend! Best choice for whom travel without your own car as the coach will pick up from where you stay and provide all equipment you need for diving! Highly recommend! Very good! Beautiful sea! Hoping to visit Okinawa again! Very good! Beautiful sea! Hoping to visit Okinawa again! Good experience, even a bit nervous at the beginning, but get used to it quickly & enjoy the journey. Good coach who helps to take nice pic. Good experience, even a bit nervous at the beginning, but get used to it quickly & enjoy the journey. Good coach who helps to take nice pic. I joined this tour with my wife. I am in my early 50s while she is in her late 30s. We joined this tour to snorkel only and did not scuba dive. Pros: Punctual pick-up from our hotel. The staff were very friendly and tried their best to communicate with us in English/Chinese. Lunch (bento) was included and hot water/tea is available on board. The boat had toilets and even shower facility. Cons: The boat ride to the Keruma islands took an hour (much longer than I expected). Although the waves were not too strong, the hour long journey was enough to make many of us seasick by the time we arrive at the first snorkel/diving spot. By the end of the trip my wife & I weren't the only ones who threw-up, and we felt so nauseous we didn't eat the provided lunch. On the snorkeling experience. The waters around Okinawa is beautifully blue and super clear. I saw a total of 4 turtles in my 3 snorkels but to be honest, the marine life is not very plentiful. There are no big fishes (sharks, stingrays..) to be seen and even the small fishes are not many and not too colorful compared to the tropical dive/snorkel places we have been to (Maldives, Thailand, Malaysia). Come for the beautiful, clear blue waters, white sand and sea turtles in summer. The water is also slightly too cold in November. I joined this tour with my wife. I am in my early 50s while she is in her late 30s. We joined this tour to snorkel only and did not scuba dive. Pros: Punctual pick-up from our hotel. The staff were very friendly and tried their best to communicate with us in English/Chinese. Lunch (bento) was included and hot water/tea is available on board. The boat had toilets and even shower facility. Cons: The boat ride to the Keruma islands took an hour (much longer than I expected). Although the waves were not too strong, the hour long journey was enough to make many of us seasick by the time we arrive at the first snorkel/diving spot. By the end of the trip my wife & I weren't the only ones who threw-up, and we felt so nauseous we didn't eat the provided lunch. On the snorkeling experience. The waters around Okinawa is beautifully blue and super clear. I saw a total of 4 turtles in my 3 snorkels but to be honest, the marine life is not very plentiful. There are no big fishes (sharks, stingrays..) to be seen and even the small fishes are not many and not too colorful compared to the tropical dive/snorkel places we have been to (Maldives, Thailand, Malaysia). Come for the beautiful, clear blue waters, white sand and sea turtles in summer. The water is also slightly too cold in November. The coach could speak English so that we could have better communication during snorkelling. The coach took care of us carefully. However, the air conditioner in the pick up car was not cool enough. We were very hot and sweating in the journey. Nevertheless, the pick up service is convenient for the clients. The coach could speak English so that we could have better communication during snorkelling. The coach took care of us carefully. However, the air conditioner in the pick up car was not cool enough. We were very hot and sweating in the journey. Nevertheless, the pick up service is convenient for the clients. Generally is good. The coach is very kind and helpful. It is pity that we cannot go to Blue Cave because of the big wave. We go to another place because it is more safer. He will take photos and send back to you later. Generally is good. The coach is very kind and helpful. It is pity that we cannot go to Blue Cave because of the big wave. We go to another place because it is more safer. He will take photos and send back to you later. He is an awesome instructor . He let me take photos And brought me to the caves. Kou is so cool !! He is an awesome instructor . He let me take photos And brought me to the caves. Kou is so cool !! 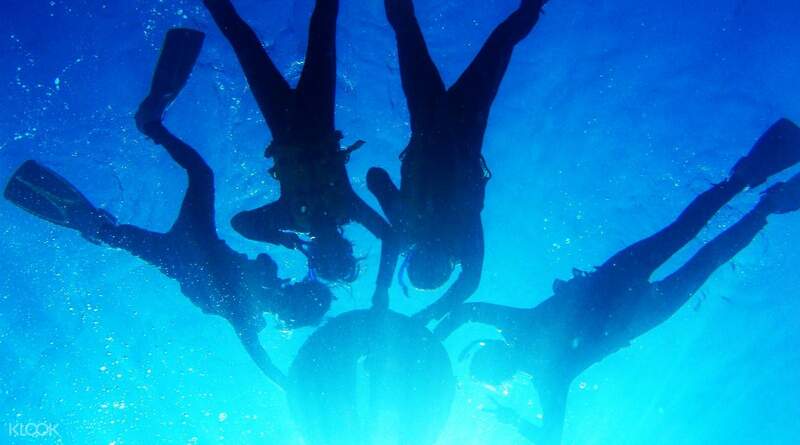 It's convenient for foreigner to experience snorkeling...the place we went is amazing. I will come back to do snorkeling again. 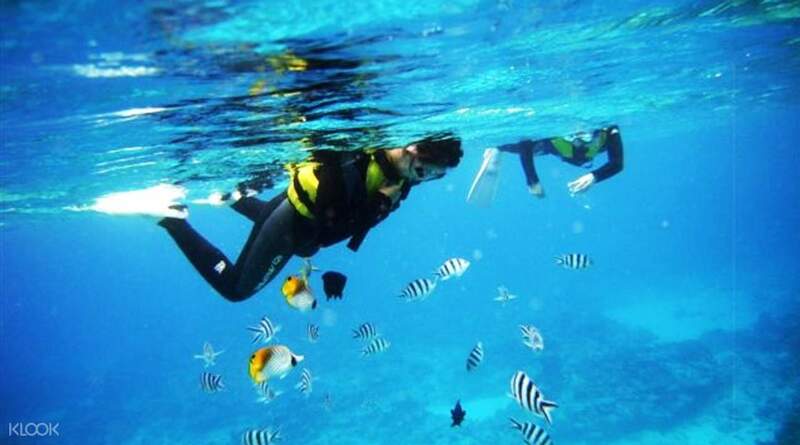 It's convenient for foreigner to experience snorkeling...the place we went is amazing. I will come back to do snorkeling again.